high cost of maintenance, then one or more of the OK series machines are right for you. 550°F and pressure to 100 psi. regulation, which gives uniform pressure over the entire surface area. unloading operation while the other tray is fusing. heat & pressure over a specific surface area, we can probably offer the perfect solution for you. banners, floor mats, carpets, mouse pads, plastics, sheet metal, tile & other ceramics and much more. transfers, hot and cold peel plastisol transfers, and laminating processes. Available in Single shuttle (standard) or Dual loading table format (optional). Ultra thick heater block assembly. Unique heavy duty linkage assembly. Even & Adjustable applied pressure. Self leveling heater block assembly. Solid loading bed with ultra thick silicone sponge. Automatic start/stop/reset timer - 'hands free' operation. Heavy duty locking casters for easy movability and solid foundation support. Weightless ease of use due to gas shock hydraulic self contained springs. 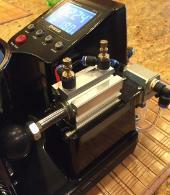 Full one year warranty on heating element, controls and entire press. 208/220/240 Volt, (30x40-Single Phase) (40x64-3 phase)- No air required. block sizes: 16" x 20"
available in a 16" x 20"
Dimensions: 32" D x 18"
16 oz mugs & steins. available in a 20" x 25"
Dimensions: 32" D x 26"
accommodates materials up to 1"
16 oz sublimation mug. Unlike other mug presses, this press has an automatic timer. the mug will be heated for the right time, every time. complete; helps avoid over explosion. heating when preset temperature is reached. be adjusted accordingly to ensure accurate pressure and clean transfers. 58" W 124" L 63"
58" W 136" L 63"
58" W 164" L 63"
that were designed ten to twenty years ago. garments the color intensity from one side of the garment to the other side will be the same. and also reducing electrical power consumption. pressure is not even across the width of the belt, “bleeding” or “blow through” is the result. width of the belt, which allows for a crisper, cleaner print. transfer to the machine frame, saving electrical consumption and printing heat. clutches and three rewinds with adjustable brake allowing for the use of different sized rolls. 405 has air regulators for each station to control the tension of material. • HEAVY MULTI POSITION CYLINDERS ALLOW PRESSING FORCES FROM 0-150 TONS. platen sizes up to 4 feet by 8 feet standard, and 8 feet by 12 feet custom! requiring a massive size heat transfer press. 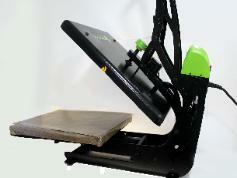 complete commercial quality, business grade heat press at an unbeatable price. Use a low amount of pressure for the best results. with sliding bottom plate for convenient production. * Lifetime warrantee on Heat Platen. * 2 Year Heat Press warrantee. * 5 Year warrantee on Heat Platen. * 1 Year Heat Press warrantee.